On July 27, 2017, Allen County Drainage Board sided with protection of vegetation on a specific ditch that Save Maumee had restored with the help of 209 volunteers who logged over 1,387 hours over the month of April 2017. 2,500 miles of ditches in Allen County, which flow into The Great Lakes, are now afforded more protection because Allen County Drainage Board understood what Jeff Sorg, elected Allen County Surveyor, could not. Protect riparian buffers on ditches! This issue is reflective of how environmental groups are moving to change a system that is bound by politics, which are now directly interfering with water quality. We all need to think about our responsibility to maintain these ditches and where that intersects with our responsibility to preserve natural spaces; and the understanding that clearcutting does neither. For years, people have called Save Maumee about the County removing trees on private property and adjacent ditches to their property. We now have a vested interest in undertaking this cause, making a stand and protecting our interests so future battles do not need to be waged by landowners. This grassroots movement has been building, seemingly unnoticed, until now. 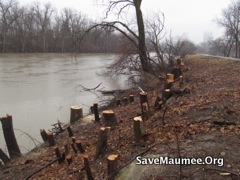 Save Maumee Grassroots Organization Inc., a nonprofit 501 (c)(3) public charity has dedicated over 12 years to cleaning up the banks of the Maumee River and has worked to improve water quality with their shovel-ready projects. To date, the group has removed over 33,000 pounds of garbage from Fort Wayne waterways and raised awareness successfully. Over their 12th Annual Earth Day Celebration, Save Maumee planted 1,100 trees over three days in Trier Ditch of New Haven, Indiana. 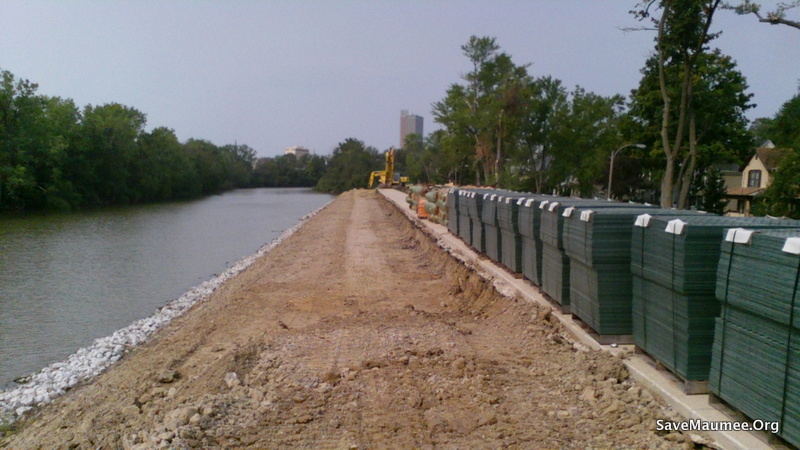 The Maumee River crosses all the political boundaries of the City of Fort Wayne, Allen County, and the State of Indiana, so the protection of the 2,500 stream miles that the Allen County Surveyor maintains is precedent-setting. 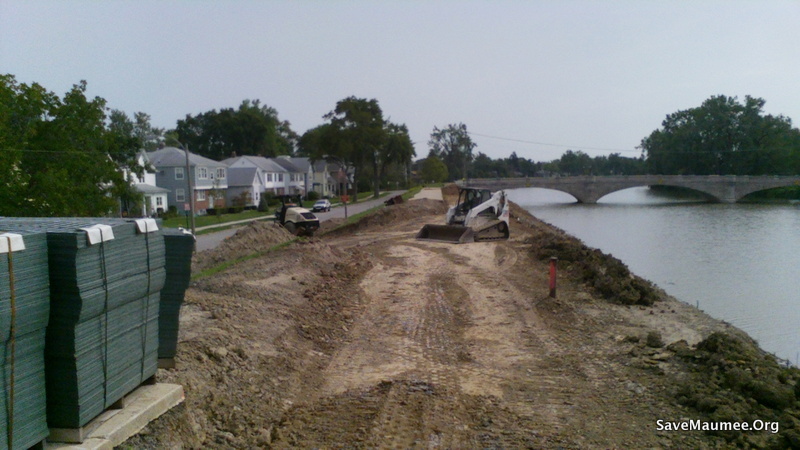 Save Maumee’s projects will not only improve water quality, but will assure that the ditches flow properly and improve water for future generations. Northeast Indiana and Northwest Ohio are home to The Great Black Swamp, so Lake Erie’s Western Basin is prone to flooding and drainage issues. We have a unique problem; we have too much water. Removing vegetation on both sides of ditches and streams is counterproductive for a number of reasons. It is common knowledge that trees improve not only water absorption but keep flooding isolated to areas where it is appropriate to flood; the water needs to go somewhere. Riparian buffer areas are able to capture large trees and brush that float down ditches when flood waters rise during rain events, so they do not clog the bridges and ditches. As you may be aware, Lake Erie is subject to two severe conditions that are getting worse: 1) there are dead zones in the central regions where the oxygen is depleted. Lake Erie is the most biologically productive of the Great Lakes and fish depend on Lake Erie. The year 2012 had the largest dead zones on record. 2) There are large algal blooms in the Western Lake Erie Basin that not only deplete oxygen, but also can cause toxins such as those that shut down Toledo’s water supply in 2014. The Maumee Watershed, and its streams and ditches, are the largest contributor to Lake Erie and to all of the Great Lakes. The causes of both of these conditions include excess nutrients that run off from farm fields and lawns, and the volume of runoff is also a contributor. The subwatersheds with the most degraded water quality should focus on improving the health of riparian areas, such as ditches and streams, because they are key to solving the problems of nutrient runoff, erosion, and sedimentation. Federal agencies are tasked with improving these conditions in the Western Lake Erie Basin and have noted that everything they can do on the federal level is still not enough. To improve Lake Erie, it is now up to small groups, individual landowners, and local governments to do the work that will reduce runoff and absorb water on the land, before it enters the rivers. The Upper Maumee Watershed Management Plan (WMP) identifies solutions, and Save Maumee’s Riparian Buffer Initiative has been funded by the Great Lakes Restoration Initiative and the USDA Forest Service to improve it. The plan identifies the most degraded subwatersheds, and they all lie in Allen County. Save Maumee Grassroots Organization has been working with Allen County’s Drainage Board, the regulatory body which is responsible for 2,500 miles of regulated drains. Save Maumee’s Riparian Buffer Initiative has already completed almost one linear mile of tree plantings on one side of Allen County ditches and streams. These restoration practices stabilize stream banks to decrease sediment, nitrogen, and phosphorus, by significantly increasing stormwater retention. The group is now requesting that supporters ask the elected Allen County Surveyor, Jeff Sorg, to retain vegetation on one side of ditches as a general rule of thumb, while the County is able to access the opposite and more easily accessible side of the ditches for maintenance. Jeff Sorg, Allen County Surveyor, who reports to Allen County Drainage Board, thinks that access limited to one side of the ditch may result in increased maintenance fees for property owners who already pay drain maintenance fees. Save Maumee disagrees because this is simply not true in every case. Great Lakes Water Quality Agreement, [Indiana] Domestic Action Plan for the Western Lake Erie Basin. This document will be enhance a plan that includes 8 States and 2 Canadian Provences, all of which contribute water to The Great Lakes Watershed. Its purpose is to improve water quality. 1) Who gets to decide what trees and plants are removed? 2) Who gets to decide what native vegetation is appropriate and should not be removed? 3) Will “they” continue to spray the rip-rap (large rocks) with Rodeo (herbicide) twice per year even though the vegetation does not present an unacceptable safety risk? 4) What are the next steps to review riparian areas in Fort Wayne, to uphold this newly passed legislation? Update May 21, 2014 The BILL PASSED ~ YEAH! Indiana Federal Senator Joe Donnelly supports the Bill and his Office expects the Bill to be voted upon within the next 2 months. The Conference Committee Chair is California Federal Senator Barbara Boxer. The U.S. House of Representatives passed H.R. 3080, the Water Resources Reform and Development Act of 2013, on October 23, 2013. The U.S. Senate passed S. 601, the Water Resources Development Act of 2013, on May 15, 2013. The two chambers are now in the process of conferencing their bills. Conference committees operate after the House and the Senate have passed different versions of a bill. Conference committees exist to draft a compromise bill that both houses can accept. Both houses of Congress must eventually pass the identical legislation for the bill to become law. The two houses can reach that identical product through the process of amendments between Houses, where the House passes the Senate bill with a House amendment, or vice versa, but this process can be cumbersome. Thus most major bills become law through using a conference committee. 1. ACE made a blanket statement for the entire USA due to the levee breech during 2009’s Hurricane Katrina in New Orleans, LA. C. Rodeo (only DNR approved herbicide) broadcast spraying (rather than spot spraying) on ALL rip-rap (stones on the side of river) to keep any and all vegetation from growing, for inspection purposes only. 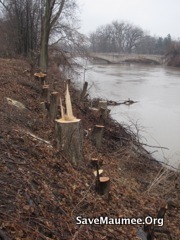 D. In addition to the 2X/year vegetation removal ON the rip-rap, ACE is putting pressure on the Board of Public Works to remove more vegetation from stream banks in addition to the riverbanks that have already been rip-rapped. E. ACE needs to define what they consider “water retention”. 1. Are these areas required to have a levee structure on it? Have natural alternatives been thoroughly researched by the Corps? Contradiction has been consistent throughout ACE’s history on such critical issues. Discussion on levee maintenance contradictions. October 24th, Indiana Rep. Marlin Stutzman PASSED a bill that will halt the arbitrary removal of trees, helping to protect the natural spaces needed to filter water, retain native life, hold soil down and save Indiana taxpaying funds $25 million! It took many of us relaying facts about retaining natural unmowed spaces next to waterways to push this issue forward. A. Rep. Stutzman was walked to his car by Abigail King at the Maumee Valley Heritage Corridor Annual Member Meeting, and informed him about levee & vegetation issues. B. Indiana State Rep. Electoral Candidate Jack Morris is very aware of the issue, and has worked with Save Maumee and Win Moses to move this issue forward. C. Bob Moris’ 15-year-old son was Abigail King’s drivers education student, so she had a chance to inform Rep. Morris. D. Allen County / City of Fort Wayne Board of Public Works Manager Bob Kennedy and his Office have discussed the vegetation removal issue in D.C. via discussions with Save Maumee representatives. To pull together all groups who want to improve water quality, help with protection and stewardship of their own waters, through exploration of the largest watershed contributing to the Great Lakes. A. The 141 mile, 9 day Canoe Trip will work to change the 2009 Army Corps of Engineers (ACE) ruling of indiscriminate native vegetation removal along rivers and streams. B. Raise community awareness about surface water (i.e. rivers, lakes, ponds, streams) problems and solutions that contribute to runoff. D. Learn and Teach so that others may mimmic our impact and love for waterways. We have been encouraging other groups to showcase their work. We are all test subjects on this trip. This legislation will create a review of current practices, so we need to apply a little pressure to let our decision makers know that Stutzman has the right idea. The current ruling for guidelines for plantings and vegetation management at levees can be completely rewritten/ overturned in April 2014. Let’s make sure it is. NOW it is up to US to make it pass this bill! Tax payer dollars have already created documents, which support vegetation buffer strips, wetlands, floodplains – these areas need to remain natural or create and protect these naturalized areas so flooding may be reduced. However, water quality suffers without enforcement of laws created to protect public health. HOW VEGETATION HELPS RIVER WATER QUALITY?